Mayors 5K Challenge – My First 5k! 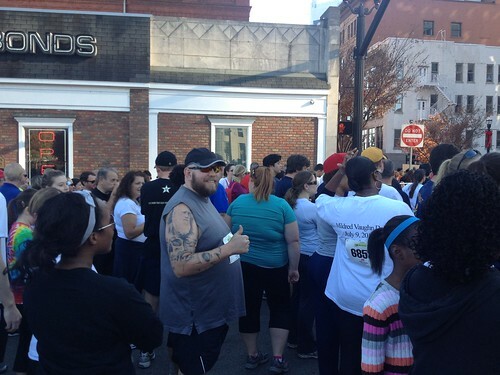 Posted byMichael Harley	 November 21, 2012 November 21, 2012 1 Comment on Mayors 5K Challenge – My First 5k! Completing 5 “races” is the second item on My 40 Before 40 list. 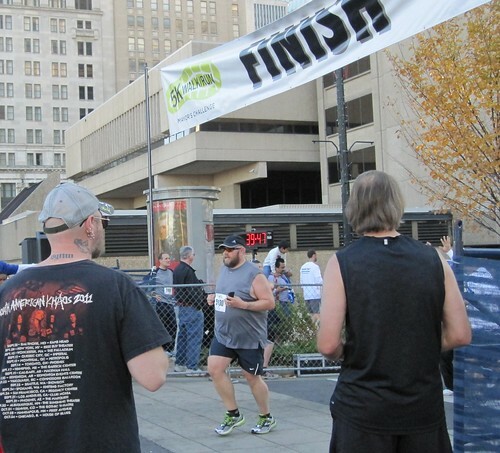 On Sunday the 17th, I ran my first ever real 5K, the Mayor’s 5K Challenge in Nashville. Going into it I really had no idea what to expect. There were lots of people — the website says 5000! — doing this thing and I was a little surprised at how many of us there were. Seeing how the corrals worked was informative. I got into the main corral; the 21-35 minute one. That seemed like a wide range so I got into the very back. I usually do a 12 minute mile so that means I should be able to finish a 5k right around 36 minutes. The course was hilly and I was a little surprised about that. You don’t really notice the hills when you’re driving downtown but that’s quite another story when you’re running. I hadn’t really ran any the week before which was a huge mistake… I should have figured out some way to make the time because I struggled on the whole run to find my zone and feel good with my pace. I’m not sure if it was all the people I was running with or the fact that I hadn’t run any that was throwing me off but I was pretty miserable the whole time. Plus, headphones were “discouraged” on the run so I didn’t bring mine. I’m a newbie runner and it’s hard to run without the music; weird I know. RunKeeper says I finished in 38:38. I thought I would be faster and was hoping for 35 minutes. Another one of my 40 before 40 goals is to finish a 5k in under 30 minutes so that means I have a lot of work to do. In conclusion, I’m happy I got this first one under my belt. I learned a lot about how these things work so I won’t have that deer in the high beams look next time. I should have probably done some recon on the course so the hills wouldn’t have been a big surprise and I should probably have made sure I was training enough the week leading up to the event. I hope to do another 5K in December. If you guys know of anything fun, let me know. I posted a couple photos below. You can check out the others here. Nervous energy! Darwin is not impressed. Yay! Congrats Mike. I’m so proud of you!! Great job on your first race, they’re totally intimidating, but sounds like you did a good job at keeping moving! !